Directed by Magdy Ahmed Ali, the film Mawlana (The Preacher) is an adaptation of the 2012 novel of the same title by Ibrahim Eissa, who co-wrote the film’s script with Ali. Mawlana was featured in a gala screening at the Dubai International Film Festival in November 2016, where the director’s work was on focus for the first time. The film reopened the polemic around religious discourse, one that was yet to take a stronger turn following the December bombing at a Cairo church that left 25 dead and over 40 injured. The film has been released across Egyptian cinemas starting 4 January and is expected to stir yet another polemic. 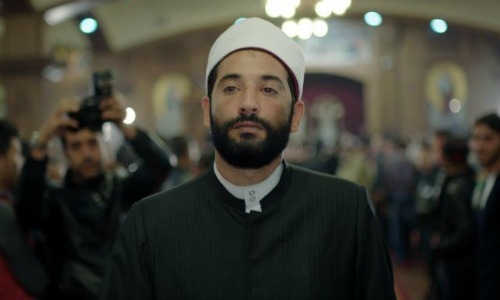 The film follows Sheikh Hatem El-Shennawi (played by Amr Saad), a new rising star among Egyptian preachers, having thousands of followers, notably among the youth. As such, he gains interest of the media, the state security apparatus and those in power. Sheikh Hatem strays from cliches and stereotypes as a populist preacher and is perfectly embodied by Saad. The portrayal is eloquent and beautifully portrays the character’s dilemmas after his quick rise to fame. 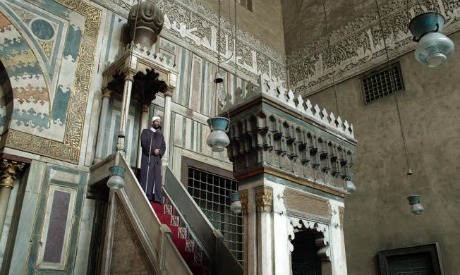 The director presents the character's social ascension by taking us up the stairs of the minaret. Upon reaching the top, we are shaken by the voice of the preacher. We see him atop his minbar, giving the Friday sermon before the prayer, which is attended by some prominent figures in power. In reality, however, the prominent preacher himself suffers. He is torn between his values and what is in his interest. Both the left and right wing try to manipulate him and benefit from his position. The film discusses the state’s exploitation of religion. In a time of crises, the regime engages in certain political strategies in an attempt to cover up its failure. It makes use of religion to create propaganda, and does not hesitate to divide the people. The regime also maintains close ties to prominent religious figures, as well as other popular figures like football and cinema stars to reach its goals, aided by the various sectors of the security apparatus. Although the film’s events take place before the 25 January Revolution, its message is generalised and not restricted to a certain period in time. Undeniably, Mawlana mainly refers to real life events and attacks which have been engraved in the public’s minds. For the first time, the film also directly addresses the rivalry between Christian and Muslim preachers, both of whom are denounced, regardless of their religion. Al-Ahram Hebdo, Al-Ahram’s French-language weekly paper, talked to the director about his vision of the film and the topic it tackles. Al-Ahram Hebdo (AH): Why did you decide to adapt journalist Ibrahim Eissa’s novel into a film? Magdi Ahmad Ali (MA): The influence of new preachers on Egyptian society has always preoccupied me. In all my previous films, there was always at least one scene where a character confronts a sheikh or a religious authority figure, like in Ya Dunia Ya Gharami (Oh life my passion). I am often angry, as I believe the state and intellectuals, notably left-wing intellectuals, do not sufficiently speak up against this phenomenon, which, to me, is a form of religious fascism. AH: So your initial idea was to criticise the new preachers? MA: I wanted to criticise the prevalent religious discourse in general. To do so, however, one must also offer alternative solutions. My aim was not to demonise religious people who claim to hold the truth, but to show their paradoxes and their suffering. AH: The censorship authority had some remarks about your film, did it not? MA: Most remarks were about the way I portrayed the various branches of the government. There were other remarks regarding the image of the sheikh in my film. Nevertheless, the censorship authority generally did not have any radical objections. Therefore, the film is shown commercially to audiences 12 years old or above. AH: Does the film directly accuse Mubarak’s regime of being responsible for the bombing at the Qaddisin (Saints) Church in Alexandria in 2011? MA: This is not an accusation of Mubarak’s regime, it is a way to confirm that we are all responsible for this saddening event: those who spread fanatical ideologies, those who do not combat fanatical ideologies or simply decided to overlook them, and the authorities who allowed extremists to use mosques as platforms to spread their ideas. In short, all those who kept quiet or simply went with it. I consider myself to be responsible for this explosion, like many other Egyptian intellectuals who were overly tolerant towards islamist movements. We cannot wait for a disaster to occur before we finally react. MA: I respected the nature of the conflict. I did not want to spread into several other secondary storylines. If the novel were to be made into a series, perhaps we could involve more details. At first, I wanted to adapt it into a television series, but then I found the necessary funds to create a film, which is what I did. AH: Why do some characters seem a little hazy? MA: You are probably referring to the character played by Sabri Fawaz. This sort of character, close to power or to the presidency, often plays quite a hazy role in real life. He has no official title, but holds a lot of power. AH: How did you prepare actor Amr Saad for this role, which is very different from all his other roles? MA: As an artist, he has always been very close to the people and their troubles. He is well aware of everything happening around us and is also an avid reader. He is certainly a very good actor as well. Saad was initially afraid of accepting this role, and of criticising a religious figure, as he feared widespread rejection. Nevertheless, I managed to reassure him. AH: With the renowned cast, the film must have required a colossal budget. How did you manage to secure it? MA: Several actors were convinced of the importance of this work and participated for free, or in exchange for symbolic gains. AH: Is Mawlana the beginning of a collaboration with Ibrahim Eissa? MA: Yes, we have indeed agreed to several adaptation projects. Eissa’s literary works are quite captivating. They are characterised by great clarity, audacity and a poignant sense of humour. He really is capable of taking historical events and transforming them into a well-written drama, which is not frequent in Arab literature.